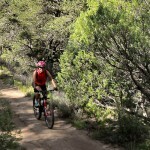 Red River, New Mexico has long been a favorite vacation spot, enticing families to return again and again, year after year. What makes a town of only four-hundred or so in population so popular? That is easy; because some things never go out of style; like the friendly towns-folk greeting you as you pass them on the street, or good old-fashion hospitality, and the earthy people who own, operate, and manage the quaint businesses in this charming old-west mountain town at over eighty-seven hundred feet altitude. For anyone familiar with Red River, little else need be said. If you are not familiar with Red River, New Mexico, then read on because once you visit Red River, you are in for a lifetime of exhilarating memories binding your buds to the taste of the little village at the top of the Enchanted Circle. There are two ways to enter Red River: from Eagle Nest to the southeast or from Questa to the west. The most exciting gateway is from Eagle Nest, for once you leave Cimarron, your journey into the woods begins (but do try to fill up before reaching Cimarron). A windy ascent takes you high into the Sangre de Cristos toward the pass at Eagle Nest. Once reaching Eagle Nest, you will find a beautiful, tranquil lake languishing amongst small motels, inns, cabins and restaurants. Eagle Nest is charming, but keep driving, you are almost there. Next stop: Red River. Winding your way down from the pass at Eagle Nest, you will at once come upon the stunning view that is the village of Red River. Powerful peaks like Wheeler, the highest point in New Mexico, surround you. Catch your breath and drive on down. Red River is not the kind of destination to rely upon walk-ins, so be sure you have checked with our Guidebook America, Red River, New Mexico members for lodging before you make your descent. 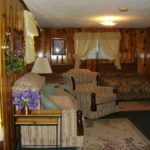 There are a variety of lodging types to choose from; quaint riverside cabins, multi-story condos near the base of the ski area, and mom-and-pop-motels. 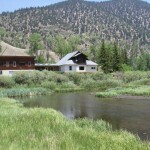 During our recent visit, Guidebook America chose The Lodge at Red River for accommodations. Rustic, warm, with a real old-west atmosphere, the Lodge proved a perfect base from which to explore the main strip of town where most everything is located. 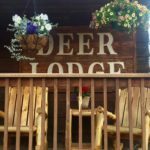 The Lodge also features both a full-service restaurant and lounge. Additionally, there are many other dining establishments, and even a couple of saloons, like The Mother-lode (also owned by The Lodge), and the Bull O’ the Woods Saloon, places where you might hear the likes of Michael Martin Murphey. Looking out from the second-story balcony at The Lodge, one can gaze upon the passers-by, the town-folk, while even imagining the rough and rowdy crowd that first frequented the little mining town in the late eighteen hundreds. An early morning rising meets with the wonderful aroma of coffee, while misty clouds rise off the mountain-tops, and the sun begins to make its way into Red River. For daytime activities, in summer one will find a host of family fun awaiting like taking the ski chair to the top of the mountain, go-carts, horse-back riding, jeep tours and rentals, bicycling, fishing, hiking, even mechanical bull riding if you think you can hang on. If you have a four-wheel drive, make the trek to Goose Lake for some of the best fishing around. The folks at William’s Trading Post were kind enough to fill us in on the do’s and don’ts before attempting to “go up Goose.” While stopped at William’s, we discovered it was a great place to cover all of our needs; we purchased the supplies we needed as well as all the souvenirs we could carry back to The Lodge. Day trips in the Red River area are worth the outing. Taos is a mere twenty-eight miles, where you will find the Rio Grande Gorge Bridge, Taos Pueblo (www.taospueblo.com), art galleries, shopping and more. 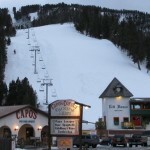 Allow a full day if possible for the Pueblo, they open at eight a.m.
Winter activities bring the thrill of down-hill skiing at Red River Ski Area, or cross-country skiing at the Enchanted Forest located in Bobcat Pass. 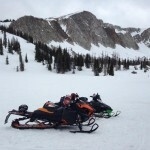 Snow-mobiling, or just a leisurely stroll, will get you where you need to go in this all-about-town destination. If you like late-night dining and night-life, skip Red River, it is not for the fast paced. Shop places like William’s Trading Post, located off the main drag; although selection may not be as wide, the cost is less. Red River is dog-friendly. Check with the lodging proprietor first, but many Red River establishments, including The Lodge at Red River, will welcome Spot or Rover.